Stages are comprised of a series of 4'x4' decks which are made of black steel frames and grey plywood tops. Stage height is variable and can be set as short as 8", or as tall as 48". Additional charges apply for heights of more than 30". Please specify the height you need when placing your order or quote. These stages can be used indoor or outdoor. 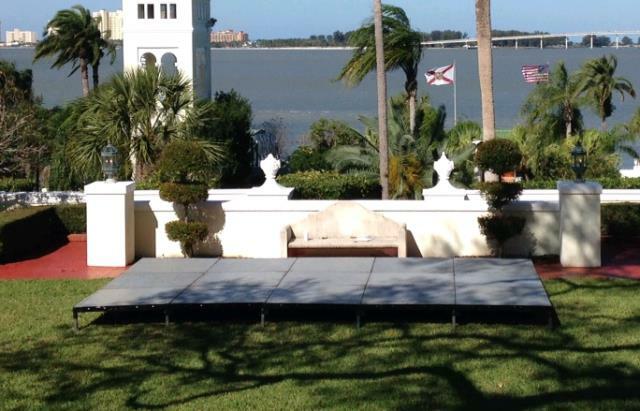 These stages are recommended for outdoor events such as concerts and backyards. * Please call us for any questions on our small festival stages in St Petersburg FL, serving Clearwater, Gulfport, Pinellas Park and the Tampa Bay Area.